Structures of large proteins and macromolecular complexes can be determined to near-atomic resolution using a technique referred to as single particle analysis (SPA). From thousands of images containing two-dimensional projections of many individual three-dimensional molecular structures, information is deduced to reconstruct the underlying three-dimensional average structure. SPA also allows determination of various structural conformations if these are present in the sample. 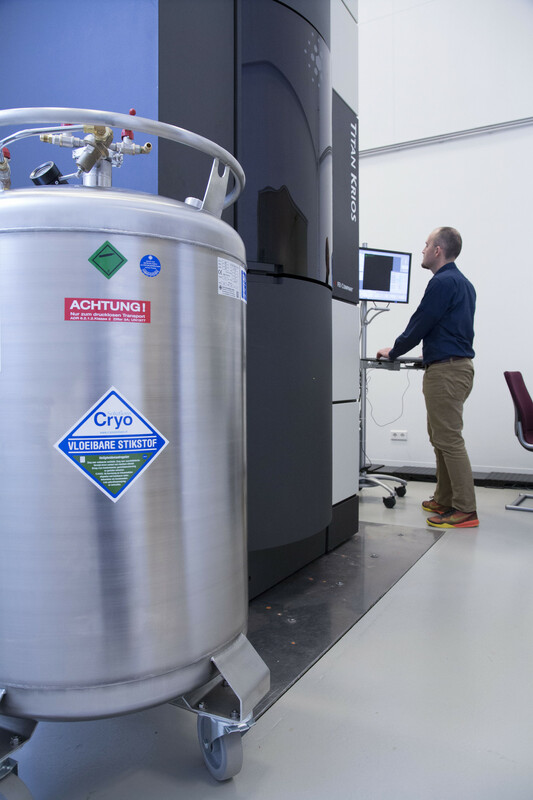 SPA requires not only excellent high-resolution images, as produced by the cryo electron microscopes at NeCEN, but also knowledge and expertise to make use of software packages to extract the information from the images. Therefore the NeCEN microscopes are optimized for SPA with the most sensitive image detectors available together with automated data collection software. Source: National Cancer Institute U.S.A.